I don't know if you'll even be e-mailing today because of your going home schedule, but just wanted to say I love you. Ths has nothing to do with anything important, but I was going through some of your old pictures you sent home on your memory card, and I didn't realize until now that some of them are videos, not pictures. I was horrified at the video of the dog and the snake in somebody's living room. IN THE LIVING ROOM !!!!!!! Also, I saw one that was both funny and a little bit disturbing - you and Elder Curtis doing some kind of . . . . dancing? (the closest descriptive word for what I watched). I am anxious for you to tell us all the background stories of all your pictures. I've got to say, there are a LOT of people that are looking forward to seeing you. I hope you have a fun "slumber party" at the mission home Thursday night. I'm not sure you will get any sleep. Hope you can sleep on the plane. Love you Brady - See you in a couple of days. I can't even tell you how proud we are !! I Love you too. It doesn't seem like its coming to an end yet but I'm sure it will hit me. I don't know if you have done this already or not, but do you remember E, the girl that was from Quincy that moved to Phoenix and Rachel met her and everything? Would you be able or Rachel be able to invite her to the homecoming talk? I don't know if she is a friend on face book or not. Also Friday night you said that we were going to have a dinner with the family and friends and roasting marshmallows, what time would that commence? I wanted to invite some friends over but I don't know what time we will be by the fire pit. I'll be on line for a little bit so you can e-mail me back. I hope you got the boxes!! There should be 3 of them. I'll tell you all about T and the MTC fireside on Friday!! Crazy week, it’s been getting a little cold here and Elder Purcell doesn't have any warm clothes with him. Two weeks ago he sent a letter home and asked for warmer clothes, so lately, in order to unify us together; I also have been on the “no coat until Purcell gets his package" campaign. Luckily it warmed up a little bit, and he did receive his package a couple days ago. if necessary. If you want to send me a schedule when all said and done so I could look it over that would be sweet. Thanks. We also met up with A again this week, the French/Swahili speaking guy. Last Sunday we set an appointment to go over and teach him with I (a recent convert from Africa), but the appointment fell through. All week we have been trying to get ahold of him to set something up. Saturday we were in the neighborhood and thought to give him a try. He was getting out of his car as we were walking up. He told us to come right in. There were some other family members in the house that spoke a little English but not enough that we could use them as a translator. We called I who was actually in the neighborhood at a friend’s house. He was over there in 10 minutes. He arrived and A started to pour out questions about the Book of Mormon and questions he had found while reading the Bible. It was awesome, he didn't want us to leave and kept asking us questions. It was crazy! next morning we went over to have a little lesson before church (church starts at 11:30) and she went off on us about how she was not going to church and she wanted us to take all the Bibles out of her house and stop with the whole church thing. She had had a weird night the night before and was very scared about coming to church and meeting with us. We talked to her and calmed her down, but she was adamant about not coming to church. We basically invited pretty hard and told her that her ride was coming in 5 minutes and then we left. While we walked outside her ride was waiting there and we told them what was going on, then all of a sudden T walks outside and jumps in the member's car and heads off to church!! It was a miracle. Later Sunday night she called us and told us that she is going to be baptized and she was ready to do it!! Please pray for her to be baptized on the 29th. I wanted to apologize if last week's letter was a little too sharp. After I sent the e-mail last Monday I felt terrible, all week. I was very stressed out and had been over loaded by a few things. I enjoy hearing about what is going on, receiving letters and pictures, and always the packages, and I read every one of them, but I really don't have time or remember on Monday mornings about specifics and even questions on everything everyone has asked. I hope you didn't feel like you were bugging me, because you weren't. I am going to try to write a few people back this week though. The baptism for C went well, even with the short notice. I attached a picture, hopefully it goes through. Its a little dark but I think you can see everybody. T has been progressing, she came to church and loved the primary program. She is scheduled to be baptized later this month. I believe she is going to be ready by then, we have been visiting her every day for over a month to make sure she will be prepared and knows it is true. She is a type of person that needs daily visits in order to keep reading and to feel that spirit to uplift her. Her and her neighbor D are going to have us over for dinner on Saturday, I'm excited. We received a headquarter referral for a man named A this week. For what we saw on the referral, he wanted french materials or someone that spoke in french to talk to him. We really didn't know what he wanted specifically, so we went over to go see him. He let us in right away and started to talk to us in french. He had a list of questions that he started spouting off and we had no idea what was going on. All we could do was hand him the french Book of Mormon and he started to read the introduction. He realized that we didn't know french and brought his friend over to help. He too only knew french. So both of them got on their cell phones and started calling people to find someone that knew french and english that could translate. I called a recent convert in the branch that knows about 6 languages but he didn't know french. He knew Arabic and different dialects of Swahili. A said he knew Swahili and I gave him the phone so he could talk to I, the recent convert. It was crazy! They were going off about something gospel related, I heard 'faith' and 'repentance' now and again with a little 'baptism' in there of course. The spirit was strong and these two men were searching for the source. We are going to see them again this week and bring I and his friend L who is also a recent convert and TEACH THEM!! It's going to be sweet! P.S. In your next letter, could you throw in some stamps? P.P.S.S. Roxanne- you maybe, might, possibly have a small chance of receiving a letter from an Elder but it is going to be sent to mom and dad address. I may or may not have traded the address for some ties?!?! It was for the tie quilt, bahahaha have fun. Things here are crazy. A man named C is going to be baptized this Saturday. He just moved here from the 3rd ward. The 3rd ward elders called us Friday night and told us that their investigator will be moving into our branch, and he is going to be baptized in a week. He came to the branch yesterday and now we need to put everything together and find fellowshippers within this week. Not much notice, but we will see what comes together. So Brother Vela called Dad and Grandpa this week. You probably know but Bro. 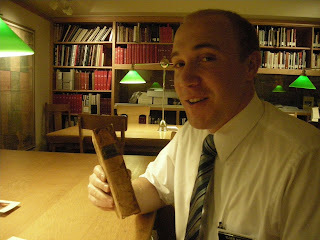 Vela found one of Arden Hale's copy of the Book of Mormon. It is signed my him with his winter and summer address. it must have been a personal copy he had, not one he gave away. Bro. Vela was so excited he had to call dad before 6 am! I didn't know the time change between here and there, and I forgot about day light savings time. Anyway, he bore his testimony in Sacrament Meeting about the whole thing, and gave me the copy of the Book of Mormon. It's sweet. Things have been going well, very stressful, but well. 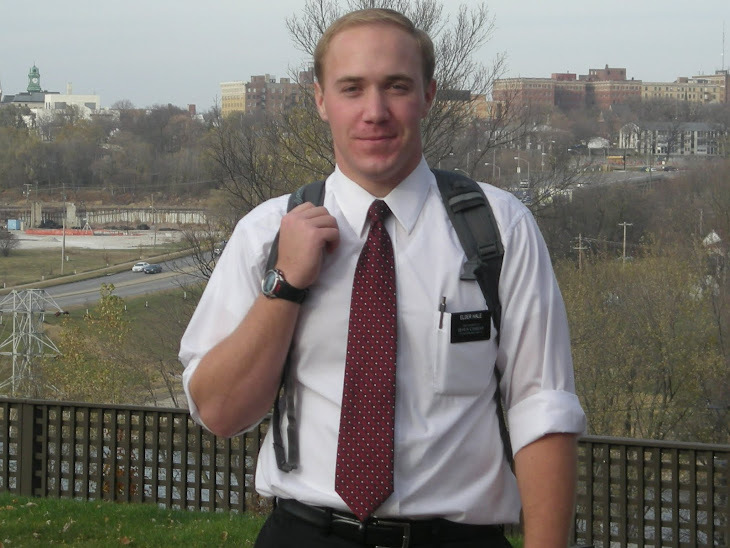 Elder H (he came out in my group) tells me every time I see him how many days we have left. He claims that it is to help the time go by slower so he doesn't have to leave, I dont buy it. I have not even thought about it yet. I truly am sorry that I do not write back or talk about what is going on at home, I pray that I do not offend you. I simply don't have time, there is too much for me to do here and I can't get my thoughts focused on something other than the Lord's work. These are sacred days an I need to make them count. It sounds like you liked my last e-mail, it didn't take me too long too write it out. Did you get the pictures that I attached with it? You had mentioned in a letter that Elder Purcell might be my last companion. 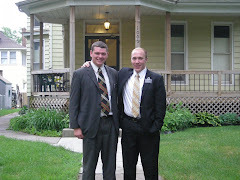 He will be, usually a trainer will train a new missionary for 2 transfers, so Des Moines will be my last area. Elder Purcell is from Billings, Montana I might have mentioned that. He is 20 years old and has 5 siblings. Before the mission he would build houses with his grandpa which is kinda neat. We are going to put him to work this week as we do service at a investigators house fixing her basement wall, and building a floor in her basement for her food storage. It's going to be great. Last week we have an investigator drop us, it was T. We were reading the 36th chapter of Alma and she stopped mid-verse and told us she could not do this "church thing". We talked about what was going on in her life and why she thought that she couldn't live the gospel. It ended up in a bold conversation with me and her about how on earth she was going to find the relief she was looking for and happiness in life if she would decide to give up. I told her she will never find it in any other church or book if she gave up and went back to drinking, smoking and fighting. I was kind of angry with her. I don't know if its a end of the mission thing, but I have been getting very frustrated with investigators and not keeping their commitments. I don't seem to have any tolerance for it. Anyway she handed the Book of Mormon back to us and told us she was done. I told her to call us in a week and tell me if she was happier. Saturday she called us, to inform us that she wanted to come back to church on Sunday. It being general conference I explained what was going on and that she was welcome to come and we could get a ride for her. She wanted to go. The next morning she was very sick, her son left the window open all night and she caught a bug, so we told her we will stop by later that day. We went by and talked to her and why she wanted us there. She wanted to come back and we invited her to baptism and SHE ACCEPTED!! It was a miracle, every time we invited her or talked about baptism, she was super, super scared of the water and would not commit to it. But this time she had been humbled and ready to do it. I got the dental work done, I went to Ankeny to a member that was a dentist and he actually did the work for free. I thought it would be discounted, but he fixed me up for free, miracle. Do you know a Arden Hale? A member found a Book of Mormon at a book store with his name in it. It's from the 60's, and the name kinda sounds familiar, but I don't know thought I would ask. Do you know about classes for school yet? I was thinking PVCC and institute at ASU through out the week. Thought I would ask, dad wanted me to get ready. I think that dad wrote me about the Taylors being at the Nauvoo pageant. When Elder Phillips and I were working there the other night we were busy talking to some members and there was this lady behind me taking pictures of Elder Philips and I. I thought that it was weird, but after I was done talking she called us over. It was Sister Taylor! I didn't recognize her at first but she told me who she was and we got a talkin. Her and Brother Taylor are working at the medical tent at the pageant. So we walked over to the tent and I found Brother Taylor and said hi. I also ran into one of Dad's Bishops when he was a Priest. His name was Bishop Mcmin (I don't know if i got the spelling right on that) but he knew Dad and Grandma and Grandpa. He told me of one of the times that Grandma and Grandpa wanted to go on a mission. It was right after they had arrived home from one of their missions and within a month they wanted to go on another. He said that he made them stay home for 6 months to get to know their children and grandchildren again. But when that 6 month mark came they were back into his office to go back on a mission. 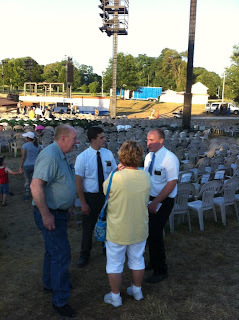 I was able to see the Nauvoo pageant for a second time, we were able to get H and E (two recent converts) to Nauvoo on Wednesday, and got special permission to see it again. I think I enjoyed it better the second time. I've been dealing with poison ivy this week. We did some geo caching with Brother G on p-day and I guess I rubbed up against some poison ivy while searching for the cach. It has been driving me nuts! Our Bishop is a doctor and he said that if you don't treat it right away, you have to just let it run its course until the oils come out of your skin. Its been about a week and starting to get a little better. It should be over this week. Saturday, Red Cross had a blood drive at the church. Now I'm not one to jump right up and give blood, needles make me a little squeamish. But a member called us up and asked if we would donate. I never say no to members so we agreed to do it. Elder Phillips has given blood many times and was excited to see what treats he was going to eat at the end of it. As for me, I am not a bleeder. I was sitting on that table for 15 minutes while they tried to get blood out of me. I was so tired the rest of the day, not a good idea while a missionary. The week went by slow, we had 5 referrals from the Nauvoo pageant and 2 of them we got appointments with. One is a 17 year old girl named J who went to the pageant with a friend, and the other is this guy named T. He's a friend of a member. I think that both will be sweet investigators this next week. T's leg was run over by a truck a year or two ago and he has a bad infection in his leg. The doctors are talking about amputating it. I felt the impression to give him a blessing, so we did. The words need not be mentioned here but he felt the spirit strongly. He has been looking for the gospel for years, searching and studying all sorts of religions. We are going back tonight to teach him the Doctrine of Christ and invite him to baptism. I'm excited. P.S. Melanie- thanks for the pictures! HAPPY BIRTHDAY MELANIE!!! I don't believe that you are 17....I sent you a card on Friday so I don't think that you have received it yet. It's not a card at all, its more like a statement. You will know when you get it. On Saturday we went to Carthage and Nauvoo with the Gardner and the Hussy family. Bro. Gardner was stoked about taking his wife to go and see everything! It was an all day thing. We started in Carthage and moved our way to Nauvoo, we had a picnic at the park across the street from old section of Nauvoo. Sister Gardner and Sister Hussy wanted to go "window shop" up by the temple on the main street. Elder Phillips and I headed strait for LDS harvest to get books. Then we just hung out with Bro. Gardner and cracked jokes on everyone, it was fun. Then we took everyone to the temple and walked around and took pictures of everything. Sister Gardner wanted to go up and touch the temple, but we told her the alarms would go off and men in black suits would run out of the temple and arrest her. Once we were done laughing we let her go up and touch it. We went to Joseph Smith's home and saw his grave, saw that blacksmith's shop, the bakery, and browning shop. We then went to the country fair and waited for the pageant to start. It was so much fun with their family. It was the first time that I had seen the pageant, the same with Bro. and Sis. Gardner. At the end they were both tearing up. Their next step is to be sealed as a family , this was a good experience for them. The Hussy's brought a recent convert, A, with them and it was a powerful moment for him. He had been struggling for a while and when the pageant was over, he walked up and told through his watery eyes that he felt something burning inside his chest. He has been through so much, foster home after foster home, abandonment, abuse, adoption, and now he feels God's love for him. It was a great night. We have been working with two young women, A and J. They are friends of a member and ask so many questions, good questions, which is surprising coming from two 17 year olds. They are really understanding the restoration and why we do what we do. We are meeting with both of them today, A has a baptismal date on the 30th of July and we are going to commit J today. Both of them are going to go to the Pageant on Wednesday along with H, and H's brother and grandma! Its will be a powerful for every one. P.S. A time ago I sent some boxes home with books in them, did you get those boxes? I heard of a missionary who sent some books home and the post office lost his books...just wondering. I probably sent some weird stuff home, but just hold on it until I get home. I will sort and dispose. 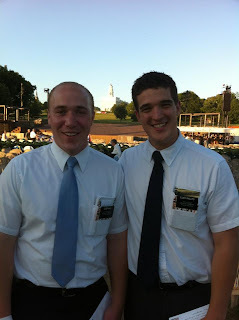 Elder Phillips and I have started working at the Nauvoo Pageant. Wednesday we worked in the seating area and greeted people as they waited for the pageant to start. We mainly go around with referral cards asking everyone if they know anyone who would want the soundtrack of the pageant sent to any of their friends. It's a good way to get the missionaries to the door step of non-members. 80 out of every 1000 doors that we knock on and use the members name will receive the gospel. Not very effective, but better than tracting, its only about 1 though tracting. Last year the pageant received 12,000 referrals, kind of crazy. Elder Phillips got one referral the other day but I didn't get any. On Friday, we were assigned to hand out the pageant newspapers at the entry by the parking lot. There were some people in the parking lot handing out anti-Mormon newspapers that looked exactly like the ones the pageant hands out. So our job was to hand out the church published copies and get rid of the anti. It was fun. We held a baptism on Saturday for M S. I don't know if I talked about her very much, her husband is a member, but has been less-active for a numbers of years. Her whole family came into town to see her baptized. She had a lot of questions and took a lot of visits. After her confirmation on Sunday, everyone was shaking her hand, and she whispered to me that all of this was able to happen because we "saw it through, and stuck in there". It was fun teaching her. She committed her husband to get sealed in the temple in Ireland, and wants Elder Phillips and I to go. I'll have to start saving money now-ish. Not too much else has happened. The other day we committed two other people to baptism, A P and S L. A's is planned for the 30th and S's is planned for the 19 of Aug. We also had the chance to eat lunch with some members on Saturday. We ate at the Pier, a cool restaurant on the Mississippi. Sorry the library was closed on Monday and yesterday we had a meeting in Iowa City for zone leader council. I think you were asking what ZLC was, its zone leader council. I received your letter yesterday and no, we were not the ones that had to go to the baptismal font in the middle of the night. We received a call from the Hannibal Elders in the middle of the night and they were on their way to the church. They live in a rickety apartment so they thought it would be better it they went to Wal-mart to seek shelter, but they thought they saw a tornado and turned around the other way and their next bet was the baptismal font. We live on the bottom floor of an old brick house. We do have a basement we can jump into if we need, or if we even wake up. By the way the same Hannibal Elders were the ones who are going to ship a turtle home. After the storm, the Mayor of Quincy was thinking about calling the Governor to declare a state of emergency because of all of the costs of fixing everything, I'm not sure if it happened or not. Some cool stuff happened this week. We saw "Our Story Goes On". It is performed by the main characters of the Nauvoo pageant. They came to Quincy and put on this sweet play about the plan of salvation. We also saw Vocal Point, it's like a BYU group that sings song and music only using their voices. They came to an old folks home, and wow the old grandmas sure loved them. And tonight we are scheduled to work at the Nauvoo Pageant. We were assigned to work there Wednesdays and Friday nights for the next month. We are the ones the walk around and ask people for referrals, probably much like the missionaries at the easter pageant, I don't really know, I'll find out tonight. Sis G and D were baptized! It was awesome, there was a good turnout from the ward at the baptism, and then a fast and testimony meeting. One of their sons J, and their daughter B bore their testimony. The whole meeting Sis G and I were trying to get Bro G to go up and bear his. We finally talked him into it. That whole family has changed. Sis G is the glue in that family and she is so solid. Just thought that I would mention this because it blows my mind. Yesterday we received portable DVD players for the whole zone. Every companionship is commanded, by the brethren, to have one and use it in companionship study. There is a huge push for missionary efforts coming from headquarters. The brethren said that this area is ready to explode and our baptismal goal will quadruple if we work with the members. They are going all out to ensure we are the best teachers. 1) Many nightly calls between missionaries are made for instructions on, "How to ship a turtle home". 2) I can eat one quart of ice cream in 5 minutes and 4 seconds. 3) When your less-active gets bored while you are teaching his wife, he could go buy 3 rats and feed them to the dogs. 4) If ever troubled with marital problems, take a fillet knife and cut out the tattoo that reminds you of that person out of your right peck. Then quickly call the home teachers. 5) Once you have been stitched up by your home teacher, put the said "tattoo" into a tanning solution in your kitchen to preserve it. 6) When 80 mph wind/storms create a danger for missionaries in your zone in the middle of the night, first, answer the phone, second, process the information, third, accept the fact that you are helpless to do anything and roll over back into bed. 7) When a tornado touches down at 1:30 in the morning, drive quickly and with purpose to the closest baptismal font. 8) Living the word of wisdom includes random missionary raids to confiscate all of the tea. 9) Days before your baptism, it is always best to shave your head into a mohawk and dye it pink. 10) DON'T EAT THE HOME MADE PIZZA!?! This week has been really crazy, there is so much we have to do still. We need to get the baptism all put together still for this Saturday, have transfer planning, plan out our lesson we are teaching at church (it's a combined 3rd hour), and create a zone leader report. I think the 10 facts covered the craziness well. A couple of nights ago this whole area got hit by a huge storm. Over 20,000 people have been out of power for 24 to 72 hours. The library just got their Internet back up today. I think I heard 12 of the 13 substations were down throughout the city. There have been trees down everywhere. We went to the members' homes to help them with all of the damage. We cleaned out a flooded basement and helped remove a tree off of the Wilford's home. We went over to Sister Hufford's home and there are huge 3 foot in diameter trees snapped in half. Some of the city still doesn't have power today. It's been crazy. Our yard was pretty torn up, the next morning we were hanging out in the trees trying to pull out all of the broken branches. I have a few pictures. By the way, I am staying here for another transfer. Roxanne- I have a missionary assignment for you. There is a recent convert here named E. She is going to be moving to Phoenix for school next month. She is going to start out at Paradise Valley Community College then going to ASU. She comes from a rough background and has been struggling recently with staying active in the church. She has no support from family, and the only thing that she has keeping her in the church is her friends. She needs a good friend to keep her on the straight and narrow. Could you send me your cell number so she has at least one person she knows down there? You might know more people that could fellowship her. H was baptized! The whole program was run by the youth. A recent convert, A, who has only been a member for a couple of months baptized. The whole week we have been calling the youth and reminding them about the baptism and what they needed to do. One of the speakers and A actually backed out a couple of days before the baptism and the chorister bailed on us the morning of.....needless to say the youth are a little difficult to work with. We even went over and helped one of the write their talk for the baptism because she didn't know what to write and didn't want to do it anymore. A little stressful, but all and all every one showed up and it ran smoothly. We had about 40 people show up to the baptism and one of our investigators, K.
We had to move K's baptism to the 2nd of July. Her husband is the one that is going to preform the baptism, but he is having some struggles. So we moved it so he can be ready to baptize his wife. Their family has changed so much since we have been visiting with them. They stopped fighting, and bickering. They are doing thing as family. Their daughter is coming back to church. And D...D is a son from a previous marriage. He is 9, not a member, and has never wanted anything to do with the church. Every time we talk to him about church or to say the prayer, he runs out of the trailer. His mom even says it would be a miracle to get him to church. We were out at their trailer a couple of nights ago and D said that he wanted to be baptized, by me. It was a miracle, plain and simple. So now the whole family will be united in Christ. We have seen a mighty change on heart. We are teaching another part-member family. Their names are J and M. M is not a member and she has many questions. We have only met with her once but the baptismal date is for the 9th of July. She is going to be fun to teach. We had Zone Conference on Friday the 17th in Peoria. It was a long drive, almost 3 hours. The other night we had a bad storm and a huge branch broke off the tree in our front yard and landed on our car. The windshield has a big hole in it and the side rear view mirror broke off. But it could have been a lot worse. It should have crushed our little Pontiac Vibe. So that was a little stressful to wake up to. So we are out of a car for a few more days until we get everything fixed. We are always flying around, and now without a car we are sharing the other Quincy elders car. It's been a hassle. I loved the package you sent me. Thanks for the cards. I do have a picture with Elder Phillips, I'll have to send it...when I get some time. So I'm not sure how our insurance works, but I have the right card with the number that you sent me. So every time I see a doctor, do you guys have to pay for it? I also wanted to ask you about getting my teeth cleaned, it been a long time a year and a half...I was just thinking about it. Thank you for the AAA card. We travel so much and are usually in the middle of nowhere. So a little security is always nice. Roxanne I like your past cards. sounds like you wedding is coming along. I have to just mention you should come get your endowments in the Nauvoo temple...I'm only an hour away and my mission president said I could go...just sayin...food for thought. There are a few things going on right now in our area. This past week we have been mostly in Des Moines at zone leader council and leadership training. Monday was p-day and had a little work to do in the evening. Tuesday, Wednesday and Thursday we were in Des Moines. We arrived home from our travels late Thursday night, around 11:30. Friday morning we conducted a baptismal interview with a woman, that the other Quincy Elders were teaching. We had a little time for weekly planning then we traveled to Memphis, Missouri for another baptismal interview. We did not have too much time in our area. Saturday the baptism for C was planned and I was asked to help baptize. She was a larger woman so two people needed to be in the font with her. Then district meeting, tried a couple of referrals, dinner and a lesson with H, and K. Sunday, church lunch and dinner with some members and another lesson with H. That in a nut shell was my week. H is planned to be baptized on Saturday the 18th. She is stoked! She comes from a rough back ground. Her dad died years ago, so it was just her, a brother and her mother. We have been doing everything we can for H. We have brought most of the young women to her lessons, as well as teaching her one of the young women's leader's homes. We have just swarmed her with the youth and with a new group of friends. There is no way that she will make it and stay in the church if she does not find a social conversion, as well as that spritiual conversion she has. But I'll send you some pictures next week when she is baptized! Things are starting to calm down. The last 2 weeks we have been using members computers to e-mail so I didn't spend the same amount of time as I usually would. We do have an apartment I think that I told you that last week. We are slowly getting furniture and things that we need to get started here. Last night we got a bike and a desk. I think the only thing that we are really wanting is an a/c. This last week had been the 90's so Elder Phillips is melting away. I don't mind it so much its just hard to sleep when its hot. This week it it wont matter. We are only going to be in Quincy for 2 days. Tomorrow we have to go to Des Moines for zone leader council, Wednesday and Thursday we have leadership meetings in Des Moines as well. Friday we have to go do a baptismal interview in Memphis, Missouri. And Saturday we have exchanges and a meeting with the stake president in Kirksville, Missouri. The new zone is doing awesome. We doubled our baptismal dates this last week, 8 official dates in the zone, for such a small zone I think that is is great. Elder Phillips and I have 2 investigators on date for baptism. I told you about H. She doing amazing. She had a rough month. Her grandma is really worried about her and is happy to see her work for baptism, and go to church. Her best friend is giving her some flack for meeting with us. She was the one that introduced H to the church and to us, but is now talks to her about how she doesn't believe in God and all the "rules" that the church makes you live (I might mention that she is about 15-16, you know how that goes...). But we have been meeting H with many of the youth in the ward and she is determined to be baptized. Her date is for the 18 of June. We taught her last night in one of the members homes that has a daughter the same age as H. It went well and H really wants to go to girls camp this summer with the young women. She will be baptized on the 18, confirmed on the 19 and girls camp on the 20th. It will help build her testimony. The funny thing is that our other investigator is B's mother. We are actually working with the whole family. Sis. G is on date for the 25th of June, but we committed Bro. G to be worthy to baptize his wife for that date. Its going to be a push, we are working closely with the bishop, and they are as well. Pray for the G family, they need as many prayers as they can get. All and all the ward has been awesome welcoming us here. We have received more member referrals in the last 2 weeks than either of us have had combined on our whole mission. Members work has been great. This next week is going to hurt with all of the traveling and meetings we need to cover, but come what may. I did receive you package with the dvd and dad's letters at my new address. Thank you so very much for sending those so fast. We have been using those in our members visits and have had a great response from them. We showed it to the Bishop's family and he started to cry so now I get to make fun of him the rest of the time that I am here, so thank you. Im doing great, I finally feel like a actuall know what I am doing and how to do it. I have felt a good spirit since I have arrived in Quincy and miracles are going to happen, we will expect them. We have a bed and an air mattress...that's all we have for the time being. Sorry for the usage of my home account. We needed some things for the new apartment. The last few days we have been doing our planning on the floor, it's killing me. This week we should have some desks, and were going to borrow some chairs from the church. Working with 4 missionaries in the same area is a little tough. There is only 1 or 2 other areas in the mission that have multiple missionaries in the ward. President just started doing this the past transfer or two. There has been a lot of missionary work done by the members here in the area. We are teaching 2 investigators from the members. We are working with a girl named H. She committed to be baptized and came to church this past Sunday. She got along with all of the young women. She is awesome. We have been trying to meet all the members in the ward as well. It's another big ward. I know these e-mails haven't been very detailed the last couple of weeks, we have been using members computers. The library has been under construction for the past 2 weeks. Next week we should be at the library, and I'll have some more time to talk. I am now in Quincy, Illinois! Its a neat story. So I'm still a zone leader and my new companion is Elder Phillips. He's a new zone leader. At transfer meeting there was an interesting assignment given to us. One of the old zones was split and a new zone was created within the mission, The Quincy Zone, and we are the new zone leaders of the zone. Its almost like white washing again. We both got here with no idea what is going on. There are two other missionaries here, one was transferred in and the other is a brand new greenie. 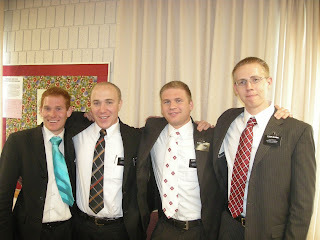 So out of the 4 missionaries here only one knows what is going on and he has been out for just a couple of months. We don't have an apartment, we just bunk with the other elders for now. we should get beds today. We went and looked at an apartment this morning. It looks good so we should have a apartment by the end of the week. It's just been very crazy to try and organize everything needed to get a zone running and to coordinate the efforts of 4 missionaries in the same ward. We had to split the area for proselyting purposes. The ward is huge! It's also the only chapel that has a stained glass window. That was neat. MOTHER!!!!! I have a huge favor to ask of you. do you remember, in a package i sent a while ago, there was a DVD called, "Preach My Gospel" with lettering at the bottom that said "District 2" It was blue with a picture of John the Baptist baptizing Jesus. Could you send that DVD to me over night? We need it very badly and we wont be able to get one from the mission office until next month. Sorry I'm a little scatter-brained right now. I can't seem to think straight. We had another Gnar-b-que at our last district meeting for the transfer this week. 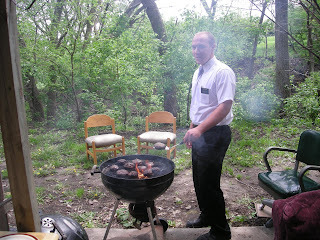 It was actually Elder Wilson's "one year click day" so we celebrated after district meeting with a district lunch Gnar-b-que! It was great. 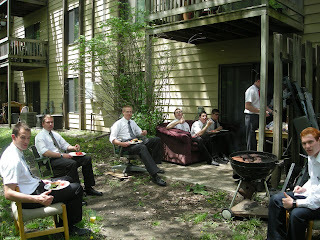 There are a couple of pictures of the whole event out side of Elder Wilson's apartment. I grilled, this has been my 4th Gnar-b-que on the mission, and it turned out great. 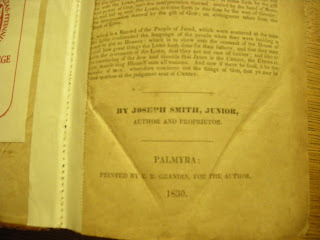 I was also able to go to Ginelle on exchanges and was able to hold in my hand a 1830 edition of the Book of Mormon. I don't think the pictures turned out very well, I wasn't allowed to use the flash but I am holding an original copy of the Book of Mormon. On one of the pictures you can see the date at the bottom of the page. 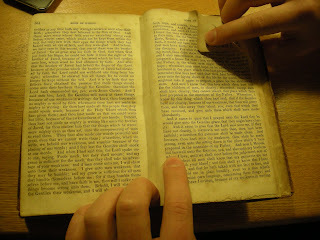 I even folded down the corner like Hyrum Smith and am pointing to the verse that they read and found solace in. It was great I felt like Elder Holland in general conference when he explained the story just a few years ago. 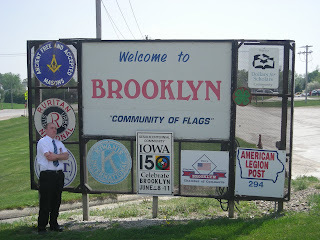 While I was on exchanges, Elder Clarke and I went to Brooklyn! Yeah Brooklyn, Iowa...It was fun, thought I would get a picture. 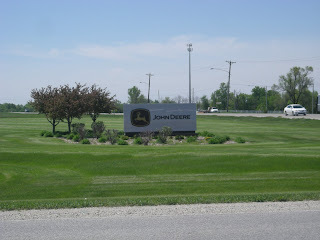 This morning Elder Bennett, Pratt, Perfili and I took a tour through the John Deere factory here in town. I wasn't able to take my camera in, but I did get a picture of the sign out front. It was amazing how big that place is and seeing the assembly line with these huge 18 foot tall cotton harvesters in different stages of assembly. They make everything themselves. They take 50 foot long pieces of steel and laser cut every part of those tractors, with welders everywhere welding and building everything. They have about 1800 people working at the factory. I thought Dad would get a kick out of it. We will have to come back and go through together. I will be transferred. I don't know where yet, but I will still be a zone leader. So that means there are only 7 areas that I can go. Hopefully I will go to Peoria, Davenport, or Nauvoo. Illinois would be great. Not much else going on, We had the first the new member lesson with the F Family. They took us to Chucky Cheese for dinner, it was a fun evening. I guess later that week, their middle child, hes only 5, started to baptize the neighbor kids in the swimming pool. Sister F recorded it and showed us. He was very accurate, full name, arm to the square, he said by the authority of Jesus Christ. Then slammed them underwater, some of the kid's heads didn't go under so he started to push their head under. It was hilarious. Mom I'm glad that you like the mother's day gift. Sister Syme made them, she is our meal coordinator. I totally forgot to ask you about it. We had a baptism this week. R was baptized first, so Sister F stood out in front with everyone else while Brother F went into the water with him. When Bro. F started to say the prayer, it was a powerful moment. This was the first time in years that he was able to use his priesthood, and the added fact that it was with his son. You could hear the emotion and love felt between them at that time. Meanwhile Sister F was crying while she was watching her son being baptized. It was neat. Then Sister F went in and was baptized. This was such a unifying moment for them. The whole program went very smooth. We watched the Restoration dvd in the chapel while everyone was getting changed. A large amount of Sister F's family was there who are not members and they loved it. President Jergensen was even able to make it with his wife. It was amazing. I dont know what more to tell you I told you everything yesterday, but just to let you know trtansfer calls are this Saturday and transfers are next Thursday so I will be e-mailing you next Wednesday. Ok, so about the skype thing. We have church in the afternoon and we just set an appointment with a lady this morning for after church, so the soonest we could connect would be around 5, so that would be like 3 your time. I think that will work out for everyone. We will have to make our time count because this could be the last time I will see you guys. Saturday there was a service project at the church. We were cleaning up the grounds. It lasted about 3 hours, but I got very sunburned. I didn't think the sun was going to be out, it's never out. As missionaries we are allowed to take our suit coats off when it is 70 degree outside. Let's just say that we have only taken our coats off a few time so far this year, so I wasn't expecting the sun to be out. But I got very, very burned. At sacrament meeting the 1st Councilor to the Bishop was conducting and thanked everybody that helped at the service project even though everyone got sun burned, then he said, "..but not as bad as Elder Hale". He totally called me out in front of everyone. It was a bad burn. There are a couple of pictures attached, this photo is of the whole generation family starting with Elder Wilson, Me, Elder Eldredge, and then my brother Elder Dearing. The second one is with President Jergensen. I almost forgot to get a picture with him because I know that you wanted one, so we were in a gas station and snagged the clerk to take a picture of us. President went out with us Tuesday night for some specialized training. We went to Sister F's house to cover some of the last commandments for baptism. President Jergensen is a talker so he started throwing questions at Sister F. He asked her how she came into contact with us, how she thinks about baptism and that sort of thing. He then asked her about when she knew it was true, since she had been taught by other missionaries in times past. This had been a question that we had never asked. We saw her countenance change and she was accepting and keeping commitments and felt that she knew, but we never had been so blunt as President Jergensen about the matter. I was a little nervous when the question was asked because Sister F is timid and a little shy about personal things and we didn't want to push that line. She answered the question referring to, I think, the second lesson that we had with her. She talked about what we covered and how it was taught. She talked about how she was totally open to learning this time without trying to find doubts. Learning for herself to find out and not for the sake of her husband or his family who are members. She shared a feeling that she had during the lesson, she said that it was an overwhelming feeling that told her "its ok, its ok". At that very point I knew that she was converted. She had felt the Spirit and it had changed her heart. I have never experienced a night like that before. I just read the e-mail from Roxanne, that's exciting!! When is the big day? I hope I will be able to be there. I can't believe that. I will have to tell all the missionaries, it will break their hearts. Everybody likes Roxanne...tee hee! That's really is cool though. Wow great news. Things in Ankeny have been great as well. Sister F is progressing so fast. She came to church yesterday in a skirt! That is big news for us. One of her concerns was that she didn't like to wear skirts and had a bad experience attending church in Utah with some of the women there. But she came yesterday for the second time now wearing a skirt. There is so much evidence that her faith is growing. She has a new continence about her, she just glows. We had a lesson with her before church on Sunday. We brought over the 1st councilor to the Relief Society, Sister Hrygil. The two of them bonded so well together. Sis. Hrygil now wants to come to all of the lessons that we have with Sister F. After church R, her oldest (he's 8), was interviewed by the Bishop for baptism. Everything is coming together. Tuesday President Jergensen is coming out with us for the night again, so we are going to take him over to sister F's for a lesson. I think he will enjoy the lesson. In the ward we are trying to do anything we can to build members trust and work with them to do their missionary work. This Sunday we are teaching Relief Society about missionary work, and as of yesterday we are now going to be working with the Priests to get them on missions. We are going to do a little lesson Wednesday night at mutual and will be attending Young Mens every Sunday. They have a few young men they want to focus on right now to get on missions and we are going to bring them to new member lessons and less-active visits. I love this ward so much and I don't want to leave. Some of the members are going to try and call President Jergensen to get me to stay, that would be cool. Thank you for the Easter packages, they were great. We both wore the ties you gave us to church on Sunday. Elder Perfili wants to thank you for the basket. I received your letters this week. You guys are so busy. I don't know how you get every thing done. I had to get some things done today so I'm sending this out late. This week has been busy. We had ZLC in Des Moines on Tuesday. And leadership training on Wednesday and Thursday. 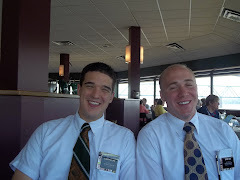 Elder Perfili and I actually had to do some of the training on Tuesday. It was the first one that I have done. I was hoping that I could just fly under the radar until I was released. We had to train on how to receive revelation through the Book of Mormon for an hour. It went well. I'll attach some of the things that we used in our training. A lot of what we focused on was teaching to concerns from the Book of Mormon. We felt like a majority of the mission took the Book on Mormon for granted in their teaching. The whole group of elder that I came out with from the MTC were at leadership so it was fun to see everyone there and catch up. Sister F and her family came to church! Sister B and her family came too and Sister S. Sister B moved her baptism date back to June 11th. She wanted some of her family to come to the baptism, they live out in Utah. She is ready and could be baptized tomorrow, but i think the main reason she moved it back was because she wanted her husband to baptize her and he needs a little time to get up to par. we had a great lesson last night with sister F. We brought Sis. G, the relief society president, to get to know her. We first taught R, her 8 year old son, the first lesson. It was short and with legos, but I think that he got the gist of what we were saying. We then started to answer one of sister F's main questions/concerns. Last time we were over there she said that she didn't know why her family couldn't be together forever as they are right now. She felt that God favored one family over another because one was sealed and one was not, and because the one was sealed the other couldn't make it to heaven. She didn't understand why God would do that. I have been studying on that question for 2 weeks. We brought over "The Family, A Proclamation to the World". We read a few paragraphs out of it with her showing her that God did indeed loves and approve of her marriage that she was in. We pointed out that that is what God wanted, a family married to rear children into the world. So not to say that a sealed family was better than a family married by the state, its not, it just wont last forever. Then we went over Adam and Eve in the Garden of Eden. We showed her that Adam and Eve were married by the Lord to work together to bring other spirit children in to the world, God told them to work together. Then we showed her that all of this happened before they ate the forbidden fruit. So when God married them, they were immortal. Their marriage would last forever but because us as humans, we make mistakes, that marriage was broken, because death entered the world. The spirit was so strong, and she understood what we were saying clearly. I know this was a long explanation of what happened but it was so powerful when we were there. Family I LOVE YOU ALL -Elder Hale Happy Easter! Nauvoo was fun. Thanks so much for the information of the family in Nauvoo, I find it fascinating. Too bad one of the houses would be under water. I've been to Nauvoo so many times I know my way around old town Nauvoo pretty well at this point. It was a long trip. A 3 1/2 hour drive to get there one way, but it was quicker than the 4 month trek the saints took so I can't complain. With such a long trip we didn't have much time to wander around. We went with J (a recent-convert, you probably remember him.) and his wife. It was cool because I didn't remember much of doing baptisms for the dead in Nauvoo when we went as a family so many years ago. But wow, that font was a swimming pool, it was huge. J enjoyed his visit there. It was great to see someone go from investigator to temple trip in one area. We also saw Joseph Smith's home and the red brick store. We then walked over to the blacksmith shop so J could get a prairie diamond. I didn't take any pictures, I only got one and it was on the way out of the temple. J gave a talk the next day at church and talked about how much of a great time he had at the temple with us. It was neat. Last night we invited another part member family to baptism. It was Sister F and her son R. We have been taking the lessons very slow so that she can understand the history of what happened in the times of Christ and in the latter days of the church. Last night was a recap on the restoration and we watched the restoration movie. We answered many of her questions she had about the Book of Mormon and the importance of the book, as well as how to use it to receive revelation. We invited her to be baptized on May 7 and she said yes!! Brother F started crying at the amazement of what just happened. We told her that her husband could baptize her and their son. Miracles have been taking place in Ankeny. Ok some answers to your letter: The pick-up truck is a missionary car. Only a few of the missionaries in the mission get one, usually the ones way out in the sticks, like the Marshalltown elders. As for the family reference I referred to - Elder Eldredge trained me, he taught me everything I know and brought me into the mission life, so he is referred to as my "father" in the mission field. I did the same to Elder Wilson, I trained him and taught him everything, so he is my "son" in the mission. So Elder Wilson is Elder Eldredge's grandson, if you're following me. Now Elder Eldredge is training again, so he now has two sons, Elder Dearing and myself. So I have a brother now. I hope you're with me. So With Elder Eldredge training I have a brother and Elder Wilson has a uncle. Now even if my father (Elder Eldredge) is a zone leader he is still father, and always will be forever and ever just after the manner that God has instilled it within his plan.